Two Cities Two Wheels: Thar She Blows! *Winds...Sustained Winds Increasing To 25 To 35 Mph This Afternoon...Gusting To 45Mph. *Impacts...Hazardous Driving Conditions...Especially For This In High Profile Vehicles. Unsecured Lightweight Objects...Such As Trash Cans And Lawn Furniture...May Be Blown Around. And so on. Long experience cycling in the Midwest teaches you to do your rides outbound into the wind and homebound with a tailwind. It's a painful lesson the first time you think you've got new strength and vigor and head 30 miles out in the country going, Man, I'm like freakin' Eddie Merckx (it's been a while since I've done this), look at me, then you turn around and struggle back into the teeth of your former tailwind as it drains all hope and spirit from your sorry corpse. Anyway, as it happened, I set off into the teeth of 25 to 35mph sustained winds. 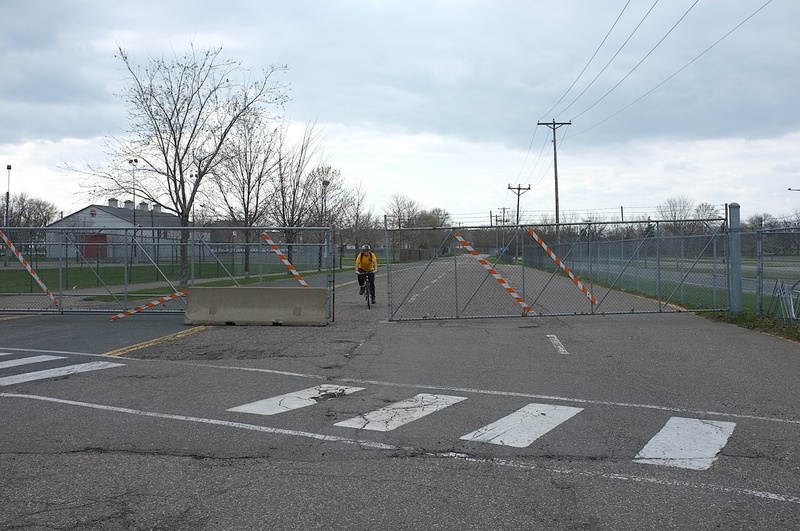 I went down Hoyt and my usual crossing of Snelling into the open gate of the State Fairgrounds after a long delay from a slow light. That gate is left open most of the time, except most of August as the Fair sets up. Waiting to cross Snelling I could appreciate the bucolic aromas blowing my way from the University of Minnesota's livestock barns. They would only get more intense until I passed by. Once at the University's Minneapolis campus, I found Washington Avenue all torn up as they add in Light Rail. I guess I shouldn't have been surprised, but it caught me off guard. 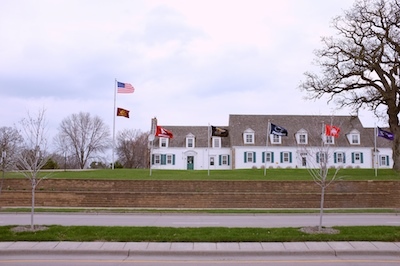 I rode to Coffman Memorial Union and locked up the bike in the crowded racks out front, then went down to the bookstore. The BikeSnobNYC had met some cyclists at the Freewheel Midtown Greenway store and ridden to Coffman Union with them. I thought about it, but didn't leave work early enough to labor another 7 or 8 miles into the wind. Thus, I missed out on bonus Snob time but did get a seat at the presentation. We were kind of wedged in there, and those who had ridden had to stand for the presentation or sit on the floor. I think it was more people than they had expected. Snob followed along with the theme of his book, pointing out that we were relatively powerless in economic terms, the $6 billion spent in the bicycle industry being dwarfed by auto companies, pharmaceutical companies and oil companies, but we could become a religion. He promoted his Lobster God, pointed out how religions are an excuse for all kinds of odd behaviours and funny clothes (he didn't mention the Mormons' special underwear, perhaps a corollary of cyclists' shorts) and then cyclist abuse could become a hate crime. 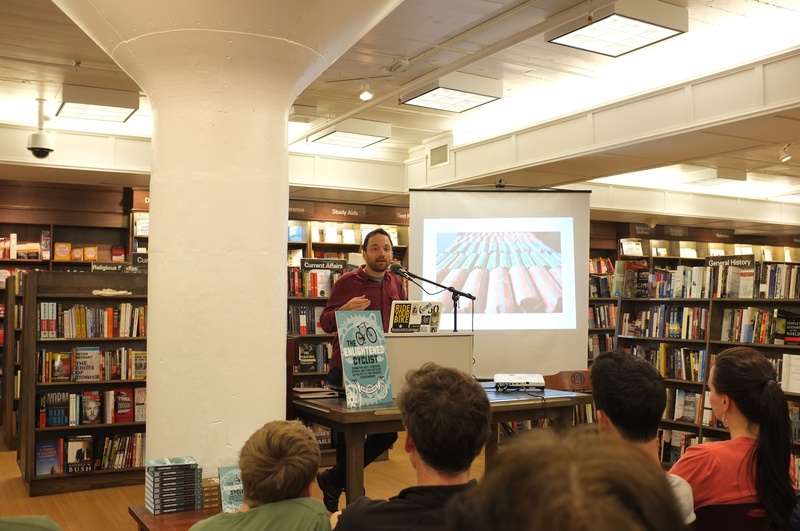 Some of the time he talked about being a good cycling citizen, which forms a large theme in his latest book, The Enlightened Cyclist: Commuter Angst, Dangerous Drivers, and Other Obstacles on the Path to Two-Wheeled Trancendence. One of the great things about Snob is that he is cynical and funny as hell in the blog yet there is an underlying good nature. It comes out in the books (his first book was Bike Snob: Systematically & Mercilessly Realigning the World of Cycling). I'd recommend reading these books. There were questions afterwards, including a couple of mine, particularly wondering if Snob was working full time when he started the blog. When I first started reading him he was only a couple of weeks in and I was pretty amazed at the volume and quality of the writing (the photography traditionally blows). Could this guy be working full time? Yes, at least to start with. He quit about the time his first book came out. People lined up to get books signed (defaced, as he calls it). He signed mine. Then I wandered on out in search of Objective 2 of the evening: trying a Chick-fil-A. I went upstairs and asked where it was. Back downstairs, but closed. It's only open 10:30 to 2:00 on weekdays, not on Saturdays or Sundays at all. What? I went back down and found the place. Yep, closed. Those are some stringent hours. 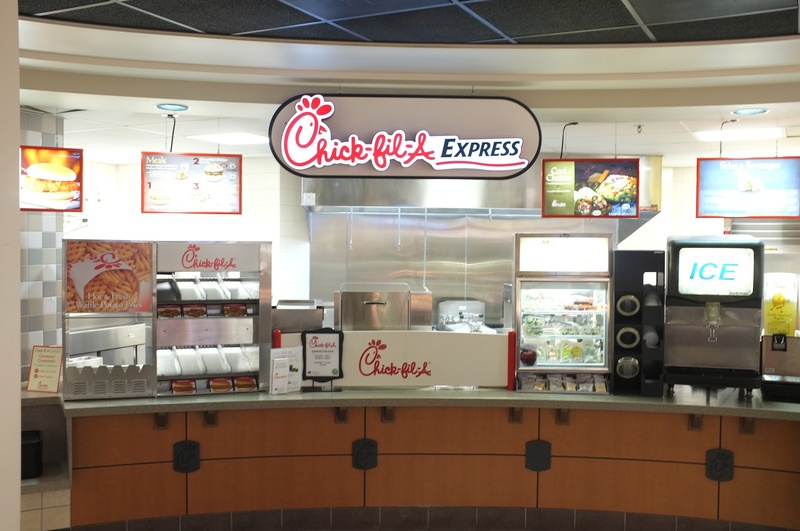 So, if I want to try a Chick-fil-A, I've either got to get myself to the Union on a weekday at lunchtime or, alternatively, fly somewhere, get fondled by the TSA, and try the one at the airport. Fil-A & a Fondle. Sounds like a decent night out. 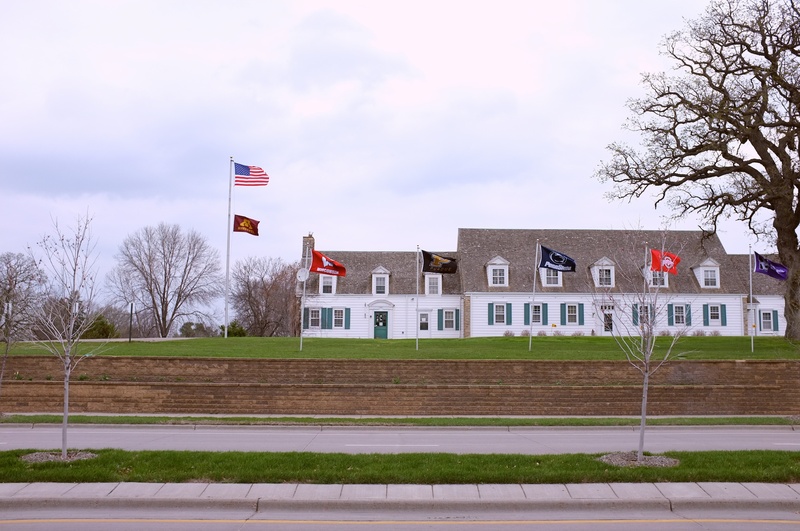 Those flags are at the University of Minnesota golf course. As bad as it is being tall on a large bike frame going into the wind, it is superb with a ferocious tailwind. I got into my highest gear (a relatively modest 91 inches, something I rarely use) and spun along Larpenteur towards home. It sure is fun to clip along at 22 mph without even trying very hard! I've heard of people doing Tailwind Centuries where, on days like this, they are taken 100 miles out into the wind by motor vehicle, then ride back for an easy 100 miles. It hardly seems fair, but I can see the allure. 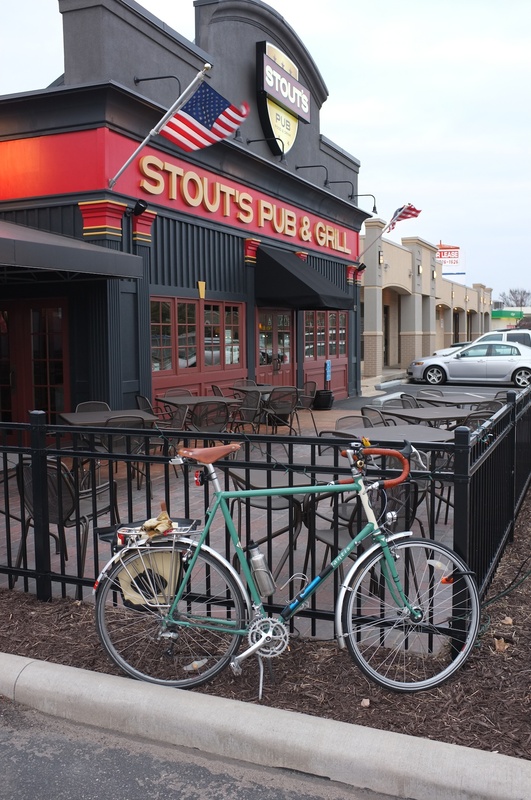 Having failed to get Chick-fil-A, I stopped at Stout's, a relatively new place plagued with utterly inadequate bike parking. They have some outdoor seating with a cage around it, so I locked up to that while I ate. Maybe restaurants don't want cyclists, maybe they just don't think about us, at least they're better than Caribou Coffee who have almost universally absent bike parking yet often have banners of cyclists hanging inside. I'm going to have to write page on retail establishments and bike parking. 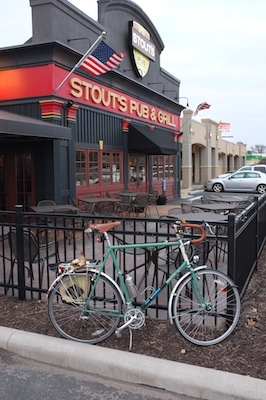 Plenty of places that you think would welcome cyclists (including, for instance, most bike shops) have nowhere to lock up despite acres of parking for motor vehicles. Sated, I cruised on home with the tailwind. I liked actually meeting BikeSnob, it was fun to hear him give a talk, good to put a face with the online persona so many of us know. I think his presentation needs a bit of work yet, but he's off to a good start and is anyway preaching to the converted. And, for all the joking about religion and barking at poor cyclist behaviour, the message is pretty classic; be nice to others, treat them as you would be treated, and try and love your fellow man despite his foibles. So glad you have posted to your blog again. I believe there are many folks who enjoy your writing and photography.